As Bill Bryson, writer for Bon Appétit wrote in one issue, "To my mind, however, the main attraction in Corvallis is the delectable Hanson Country Inn. A handsome Dutch colonial-style farmhouse, dating from 1928, the inn sits on the edge of town in a small rise overlooking a beautiful five-acre meadow fringed with deciduous trees that fairly blaze with color in autumn. Four sheep were picturesquely cropping the lawn when I arrived, adding to the sense of rustic serenity. The Hanson is the domain of Patricia Covey, a former San Franciscan who bought it sight unseen in 1987 -- rather a daring thing to do, as the building had been empty for 13 years... The Inn offers a comfy elegance -- big fireplace, lots of books, sofas you could wallow in, and bedrooms to match. Mine was good-sized without being fussy, and had a plump, high, well-proportioned bed to die for, or perhaps in. The appointments included an attached small study, with a TV and a private bath with shower. I could have been very happy there for a long time." Sunset magazine did a photo shoot in the lovely gardens and wrote in one issue, "Outdoors, a rose garden, a gazebo and brick pathways give the inn a genteel air. 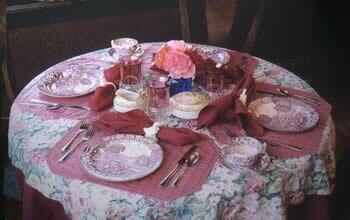 Inside, New Zealand gum paneling, floral prints, and vintage china set the stage for some old-fashioned berry treats..."